Sweet pepper jam. It’s a little tangy, a little tart, a little sweet, and a little savory. But it’s all delicious. Get a pot of this bubbling on the stove and it’ll fill the house with an aroma that will leave your mouth watering. Only a few ingredients required, then just wait until it cooks down and thickens up. It can definitely be canned, but it may not even last that long. Pick up a peck of peppers (or harvest your own) and chop them up. You can go for all one color if you want a uniform result – mine are always in various stages of ripeness, so it ends up being a mix of red, yellow, and green. Toss in a jalapeno or two if you want it spicier. Dice up an onion and smash a few cloves of garlic. Dump everything into a saucepan along with some cider vinegar, a little sugar (can be varied depending on your preference), and some salt. Bring it to a simmer. Cook for five minutes or so, then when the peppers are soft, puree the whole mess with an immersion blender. (Note: blending is not a necessity. I sometimes make a batch and leave it chunky). Simmer for another 30 to 60 minutes, giving it an occasional stir. You want it to thicken up enough that it’ll stay on a spoon if you tip it. Put it in jars – it should keep in the fridge for several months, or you can process for 10 minutes in boiling water for longer-term preservation. Combine everything in a large saucepan and bring to a boil. Reduce to a simmer, and cook for about 10-15 minutes, or until everything gets soft. Using an immersion blender, puree until smooth. You can also just partially puree it if you like things a little chunkier. Continue to simmer until it reduces and thickens, another 30-60 minutes, depending on your preferred consistency. Refrigerate for several weeks, or process in a boiling water bath for 10 minutes (half-pint jars). 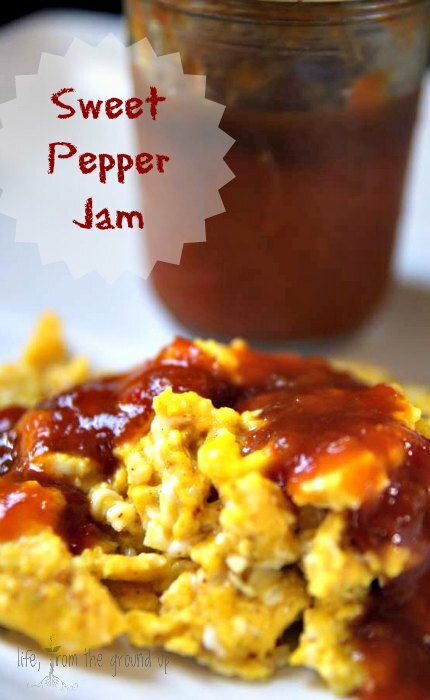 This sweet pepper jam is delicious on all sorts of things. 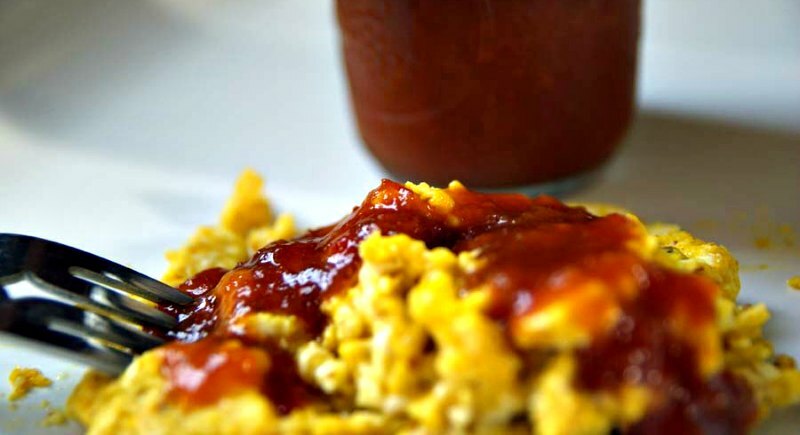 Its most common use around our house is on top of scrambled eggs. Spread it with goat cheese onto crackers. Eat the chunky version with an Italian sausage. Or best of all, make a breakfast (or lunch) sandwich with eggs, a fresh sausage patty, and an English muffin. Yum.